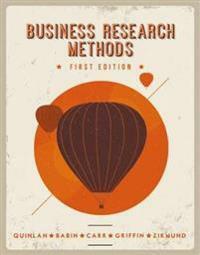 Christina Quinlan joins William Zikmund, Barry Babin, Jon Carr and Mitch Griffin in this new first edition of Business Research Methods, which combines the qualitative and holistic approaches found in Christina Quinlan's texts with the quantitative and advanced methods of William Zikmund's. This is a comprehensive and interesting text that is essential reading for any business student taking a research methods module. Each stage of the research process is considered, including ethics and philosophical frameworks.